The classification of fusible adhesive lining. Adhesive lining production originated in Europe. In 1952, an Englishman K-Tanner used polyethylene as raw material, with the method of powder coating on fabric and forming fusible interlining. Although polyethylene has better washable performance, but the feeling is hard, only used for shirt collar. After 65 years, Germany and Switzerland respectively developed polyamide hot melt adhesive successfully, and later, dot coating equipment researched, made the variety and quality of fusible interfacing of a new breakthrough. Since 1968, adhesive lining developed rapidly in foreign countries, Europe accounted for 30% of the total amount at that time, and it increased to 90% in 1980s. Fusible interlining technology has been able to meet with fashion diversification requirements, and is suitable for industrialized production, so it is called a revolution in clothing technology, it is an important symbol of industrial modernization for clothing. According to coating method, there are four kinds of adhesive lining. Powder dot fusible interlining: adhesive particles sprinkled in the pits of rolls, with certain embossing pattern on base cloth, the particles are distributed uniformly and regularly. This method used widely at present, applicable to any kind of textiles. 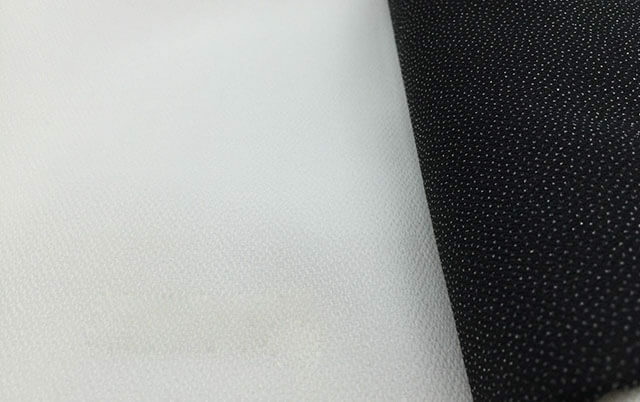 Pulp dot fusible interlining: This method is suitable for heat sensitive material, such as nonwoven fabric and not easy to bonded fabric coating processing. Fistly make the hot melt adhesive modulated into a paste, then glued to the resin particles on the base cloth by round net way. Spraying method interlining: It is the earliest and simplest method of bonding interlining. Spraying the hot melt powder to the substrate, the formation of size and distribution are irregular, used as low grade interlining, such as non-woven lining, leather, shoes and hats, trim. Double dot fusible interlining: Or called non fusible interfacing. Scattering two layers of coating on base cloth and effect the bottom of cloth and upper lining bonding perfectly. It is suitable for the requirement of high quality and hard adhesive interlining.